New book, 80 pages, DUE14. The Ironclad was a revolutionary weapon of war. Although iron was used for protection in the Far East during the 16th century, it was the 19th century and the American Civil War that heralded the first modern armored self-propelled warships. With the parallel pressures of civil war and the industrial revolution, technology advanced at a breakneck speed. It was the South who first utilized ironclads as they attempted to protect their ports from the Northern blockade. Impressed with their superior resistance to fire and their ability to ram vulnerable wooden ships, the North began to develop its own rival fleet of ironclads. Eventually these two products of this first modern arms race dueled at the battle of Hampton Roads in a clash that would change the face of naval warfare. 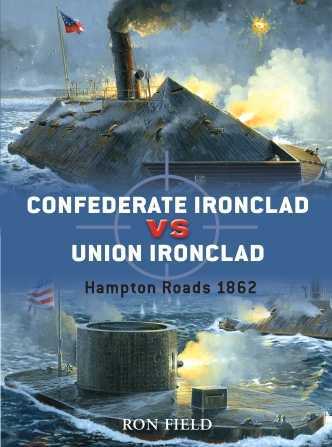 Fully illustrated with cutting-edge digital artwork, rare photographs and first-person perspective gun sight views, this book allows the reader to discover the revolutionary and radically different designs of the two rival Ironclads - the CSS Virginia and USS Monitor - through an analysis of each ship's weaponry, ammunition and steerage. Compare the contrasting training of the crews and re-live the horrors of the battle at sea in a war which split a nation, communities and even families. This item was added to our catalog on Friday 07 November, 2008.